If you love playing roulette or blackjack, you shouldn’t miss out on Casumo’s latest live casino promotion. Take a seat at their brand new live casino and try out the games for a chance of winning big cash prizes or valuable Apple products! If you open Casumo’s live casino, you will probably notice that a lot has changed. The casino has released a brand new live casino that both looks and works great, and right now you can win some awesome prizes by trying your luck in roulette or blackjack. Just place a bet, and you could go home with Apple gadgets or a big chunk of cash in your pockets! Join the Casumo Live Roulette between the 6th and the 9th of August and place a bet of €10 or more in order to join the giveaway. Win or lose - the raffle ticket is still yours. Follow the prize draw on the 12th of August where the lucky winners will get their hands on some seriously cool prizes, including an Apple package, an iPhone X and much more. Your bet will also get you an entry into the €10,000 main raffle that happens on the 19th of August. 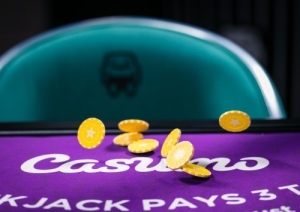 If you’d rather play blackjack, you can take a seat at the Casumo Live Blackjack table between 13th and the 17th of August for a chance of winning extra cash. 20 golden cards will be placed randomly in the decks, and the top prize is €500 in instant cash. If you’re dealt a gold card, you’ll get the money straight to your Casumo account. A bet of €10 and more will also give you a ticket to the €10,000 cash raffle on the 19th of August, so you have even more chances of picking up some extra money. Read the full details at Casumo. ENJOY THE NEW LIVE CASINO AT CASUMO! It’s a great week for slot players as well, as Casumo has prepared special Reel Races every day this week. Play excellent games such as Legacy of Egypt and Moon Princess for a chance of winning up to €2,000 if you manage to beat the other players. A new race kicks off every evening at either 20:00 or 22:00 CET, so get ready to fire up the machines and start spinning. Earn points by hitting consecutive wins and big wins, and the players at the top of the leaderboard once the race has ended will run away with the prizes. You can learn more about Casumo’s popular Reel Races by clicking on the link.